This online course is a four semester hour course delivered at a distance and includes a virtual laboratory component. It is designed for individuals with a baccalaureate degree who need a second semester of biology as a prerequisite to apply for admission to a health profession programs. 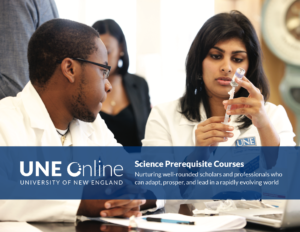 The overall goal of this online course is to provide the student interested in the health professions with an introduction to biology that emphasizes the concepts that will be important for, and provide the basis for, the topics – considered in biochemistry, molecular biology, cell biology, pharmacology, and physiology – which the student will encounter in their professional studies. To achieve this goal, the course emphasizes a conceptual approach to the principles of biology. The student is encouraged to learn factual material within a conceptual framework in order to achieve an understanding of basic biological theory. By doing so, they will be able to apply this material to their further studies. Numerous examples, largely relating to human biology and especially to human health and disease, are provided to encourage this process. The Online Medical Biology II course content considers principles of evolution as related to biological thought, surveys the six kingdoms and population biology – placing an emphasis on health sciences applications – and discusses several “special topics” relevant to human biology. Click here to see the syllabus for Online Medical Biology II. BIO 1010 (Medical Biology I) must be completed before registering for this course. All prerequisite courses must have been completed successfully within the past seven years.